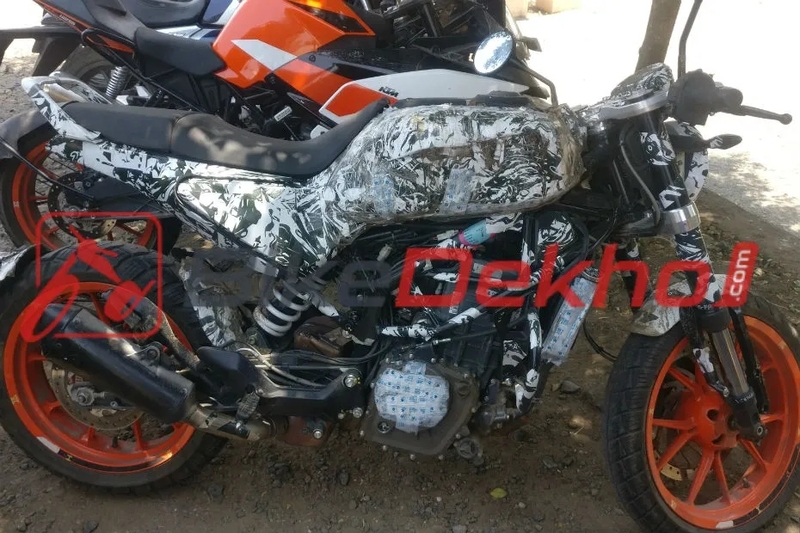 As Husqvarna continues testing its 401 motorcycles in India, another heavily camouflaged test mule of the Vitpilen 401 has been spotted. The Husqvarna Vitpilen 401 test mule features KTM-sourced alloy wheels shod with MRF tyres. The Indian-spec model, unlike the international Vitpilen 401, has a split seat. Rakesh Sharma, Executive Director, Bajaj Auto had stated in February 2019 that the production of the Husqvarna motorcycles would commence at the Chakan plant in a few months. The India launch details are scarce although the launch of the Husqvarna 401 duo, as told by Rajiv Bajaj, Managing Director, Bajaj Auto, should happen in 2019. The motorcycles, as reported earlier, will be sold via the KTM network. 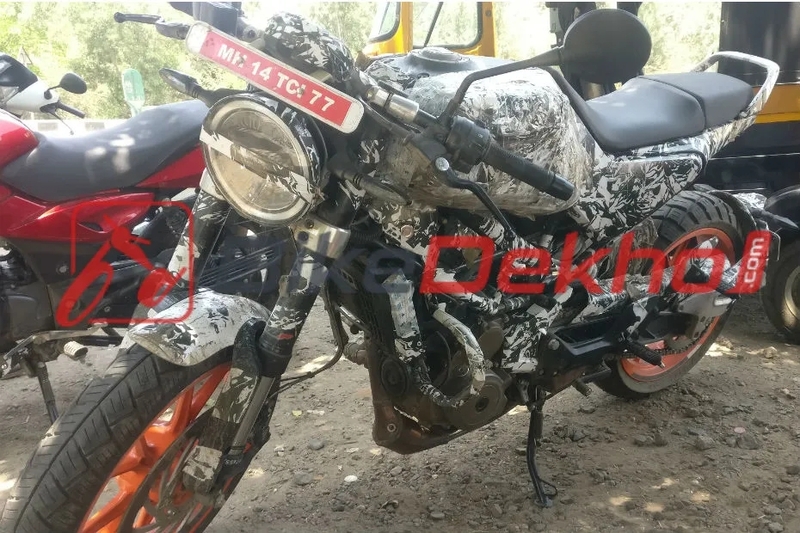 Given the launch timeframe, the Husqvarna 401 duo would most definitely arrive with a BS-VI compliant motor and the latest spy images further confirm that point. The motorcycle seen in the spy photographs features a different catalytic converter and a re-routed exhaust downpipe. The revision in the design hints that the engine has been overhauled to comply with the new emission norms (BS-VI) that would come into effect from April 2020. Apart from the changes to the exhaust and the catalytic converter, the test mule has KTM-sourced alloy wheels. Do note that over a year ago (February 2018 to be precise), the Husqvarna Vitpilen 401 and Svartpilen 401 were seen with wire-spoke wheels. The images that followed showed the test mules with alloy wheels. The bright orange alloy wheels look too flashy on the Husqvarna motorcycles, and we hope that the bikes retain the wire-spoke design. The alloy wheels are wrapped in MRF tyres. The test mule is equipped with KTM-sourced crash guards as well. Lastly, unlike the international-spec Vitpilen 401, has a split style saddle. The Husqvarna duo would retail in a price range above the KTM 390 Duke, and we expect its prices to fall in the INR 2.8-3 lakh (ex-showroom) range. The Husqvarna Vitpilen and Svartpilen 401 would retail in a price range above the KTM 390 Duke. So expect the motorcycles to cost close to INR 3 lakh (ex-showroom). The Vitpilen and Svartpilen 401 will share the 390 Duke and RC390's 373 cc single-cylinder liquid-cooled engine that delivers 44 PS of maximum output and 37 Nm of peak torque, but most likely in a different tuning.